Steam – Standard design pressure of 150 PSI; Low pressure also available. 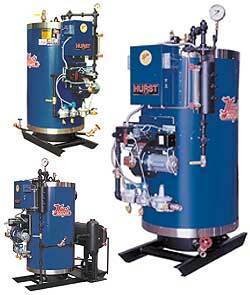 Steam outlet valve, slow opening blowdown valve, feedwater shut off valve, and check valves included on boilers through 30Hp. You can package the Cyclone along with a feed water system. 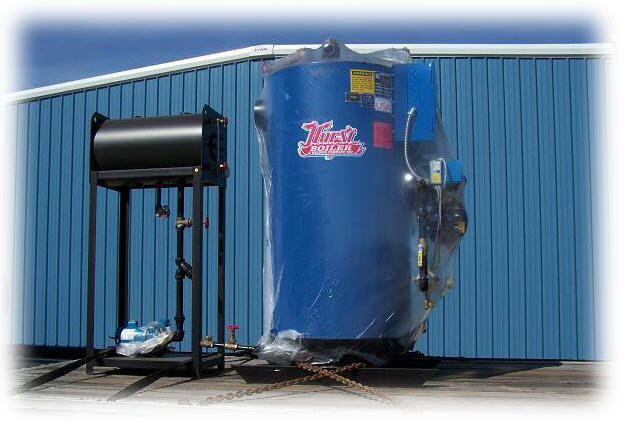 Have everything mounted on a single skid for easy installation! Capacity to handle swing and spike loads – quick recovery – quick response. The larger steam-release surface is calmer, reducing carry over of unevaporated water. The resulting drier steam also reduces system scaling. 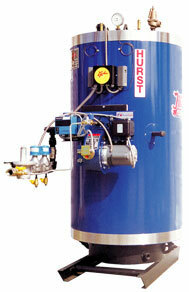 In addition, dry steam helps to eliminate unnecessary extra condensate. Energy and fuel are saved. Longer life results. The waterside openings are located in the most effective positions. The lower handholes offer far better access for both cleanout and inspection. These more functional locations avoid the obstructing handhole “tunnels” used by our competitors. The top opening offers a strategic view of the furnace crown sheet. 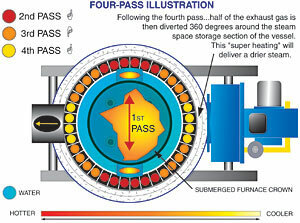 The gases leaving the furnace are split four ways and travel through four individual serpentine fin passages to the stack outlet. travels its own four-pass path (see illustration below). 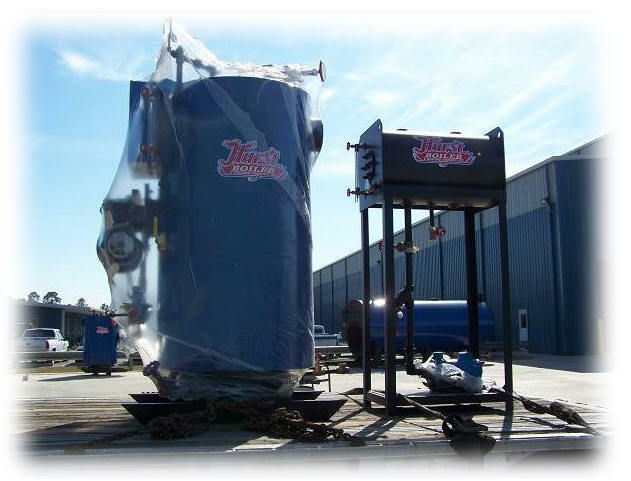 Heat transfers evenly to the fins and boiler shell, eliminating the metal stress due to uneven heat transfer common in other designs.